One of the highest and noblest expressions of art will always be that of the English, for instance Millais. Van Gogh. 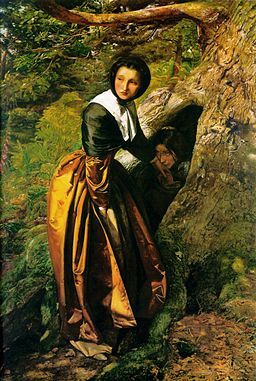 John Everett Millais was born in Southampton to well-to-do parents. He was considered a child prodigy and was sent to Sass's Art School in 1838, winning a silver medal at the Society of Arts at the age of nine. In 1840 he was admitted to the Royal Academy Schools as their youngest ever student. Millais was made an Associate of the Royal Academy in 1853, and a full member in 1863. In 1885 he was created a baronet and in 1896 was elected President of the Royal Academy. Millais was admired by Ruskin as well as by Van Gogh. Those two fans should give us pause. Both are heroes of intensity and craggy passion, of art and belief. At its best, the art of Millais and his pre-Raphaelite brethren speaks - with force and courage - of deep emotional truths. The following paintings by Millais were in the collection of BG Windus. Ruskin: "On the whole the perfectest of his works, and the representative picture of that generation-was no Annunciate Maria bowing herself; but only a Newsless Mariana stretching herself"
The painting relates to the massacres which took place on St. Bartholomew’s Day 1572 in Paris during the Wars of Religion. The man is a Huguenot who is refusing to accept the Roman Catholic badge his lover is trying to convince him to wear to save him from harm or more possibly death. The Hugenot is depicted at the crucial moment of choice between earthly love and spiritual devotion as he looks into his lover's eyes. Men lingered . . . for hours, and went away but to return. It [A Huguenot] had clothed the old feelings of men in a new garment, and its pathos found almost universal acceptance. founded on Boccaccio's story about a woman in medieval Florence whose brothers murdered her lover because he stood in the way of a prosperous marriage. The painting illustrates the feelings of the two brothers on discovering the mutual love of Isabella and Lorenzo. Ophelia is the daughter of Polonius and sister of Laertes in William Shakespeare's play Hamlet. She is singing before she drowns herself after learning of her father's death and being spurned in love by Hamlet. The model for Ophelia was Lizzie Siddal, Gabriel Dante Rossetti's future wife, and the intricate leafy background is a spot on the river Ewell, near Kingston. The painting illustrates an old supersitition, that if a bridesmaid passes a piece of wedding cake through the wedding ring nine times, she will see a vision of her future lover. She has a piece of wedding cake and an orange on her plate in front of her. The orange blosoom on her dress signifies purity, innocence and chastity. The model was noted as Miss McDowell in the Journal of the Pre-Raphaelite Brotherhood of 9 February 1851. This picture is also seen with the apparently incorrect title - The Bride and All Hallow's E'en. It was bought by B. G. Windus and sold at Christie's in 1862 under the new title. Of all the pictures that Millais created, this was his favourite. The nun on the left is digging a grave, which is positioned in such as way that the viewer appears to be in it alongside her. The second nun's rosary has a skull attached to it. In the background a coffin-shaped cloud - a harbinger of death, according to Scots legend - appears in the evening sky. Two girls adding petals to a large glazed bowl with petals and flowers scattered on the floor. 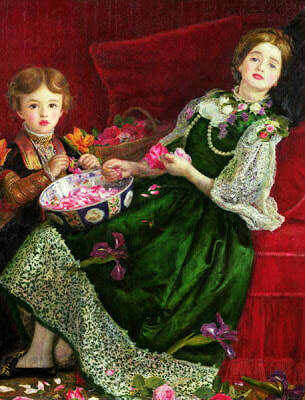 According to Lady Millais: "This little picture was painted for a Mr. Burnett, but when completed he was unable to purchase it. It was painted from my sister Alice and little Smythe of Methven Castle, Alice's dress of green satin and point flounces forming a happy contrast to the rich velvet and gold trimmings in little Smythe's dress. The background is principally crimson, and the whole effect very rich and brilliant". "When Mr. Burnett saw it he was most anxious to get it, and White promised it to him if he came on a certain day not later than four p.m. Mr. Windus, however, was equally determined to have it ; and, arriving early on the appointed day, he waited till the clock struck four, and then carried off the picture in a cab, to the great disgust of Mr. Burnett, who arrived a quarter of an hour late." features a Puritan girl risking her life to bring food to a Royalist taking refuge in the hollow of an oak. It commemorates the Battle of Worcester in 1651 which ended the English Civil War and the escape of Charles II who hid in the Boscobel Oak in Staffordshire. Miss Ryan was the model for the Puritan girl and the painter, Arthur Hughes, sat for the Royalist. The tree, in Hayes, Kent, still stands and is known as the Millais Oak. The painting, owned and probably commissioned by BG Windus is a reduced scale replica of the original version which is now in a private collection.